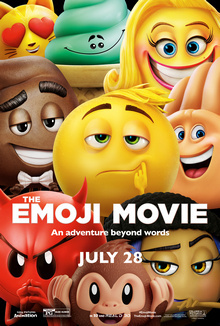 Upon hearing the premise of The Emoji Movie, reactions weren't exactly welcoming of the idea. But, considering what a wonderful cinematic surprise was delivered based on Lego, it wasn't outside the realm of possibility for another cinematic surprise to make itself known here. If only, as the end result is a shiftless cash-grab that'd be more welcome in a bargain bin at a local supermarket chain. Hidden within smartphones lies a world populated by Emojis. Everyone has their role to play, delivering a particular expression, but Gene (T.J. Miller) finds he can convey more emotions than just his Meh persona. He merely wants to do his job, and not to stick out from everyone else, so journeys to The Cloud in order to try and be a regular Emoji. It does the film no favours to compare it to Inside Out, but that's all which comes to mind upon viewing. The plot follows more than closely enough, to the point it's invading the 2015 film's personal space. This leaves Tony Leonidas's film to come off as a cheap attempt at copying not just the Pixar film's success, but the Pixar film itself. While both animated features depict the struggles of a human child, but this is where those particular similarities end. Riley's journey led to moments of self-exploration, development and insight, which many viewers of all ages could see reflected in themselves. In this film, Alex is upset because he sent the wrong Emoji to his crush, and his phone keeps blaring music. It's a bit too simplistic and shallow, leaving little to engage with in regards to this bland character. While saying this, he may actually be one of the more preferable characters, merely because he isn't as awful as the rest of them. In regards to our lead, Gene more than lives up to his Emoji status, as he's quite meh. T.J. Miller is more than ready to voice the disinterest in his character, but forgets that other emotions are also meant to be exhibited. Essentially the Emoji version of Divergent, he's as thinly written and unengaging as the rest of the film. The kind of character who you can guarantee will receive cheers by the end, in spite of causing all the problems in the first place. James Cordon voices Hi-5, a no longer useful emoji who proves more to be more of an irritant than thrush. The cause of more problems than solutions, this is one character that leaves you reevaluating the famed hatred of Jar Jar Binks. Then there's the contradictory character that is Jailbreak, voiced by Anna Faris. There's an inkling of an idea here, as the character seems to be a way of breaking stereotypes involving romance and gender. Such a shame it's all thrown away, as the film more than willingly submits her to said stereotypes, at the cost of her underdeveloped dreams. In actuality, all the problems here lead back to one key thing; from beginning to bitter end, there's nothing which feels like some form of effort was put into it. The characters are poorly written, brought alive by bored performances, merely to pass off some basic and eye-roll worthy jokes. You don't need to look any further than Sir Patrick Stewart, whose character only exists as a vehicle to deliver half-hearted toilet humour. Earlier this year, Captain Underpants: The First Epic Movie showed how toilet humour could be wielded in a humorous and chucklesome manner. This is scraping the bottom of the barrel, to the point you're making holes and actually scraping the ground. As much as the screenwriters try to pass off insight into the smartphone wielding generation, what they've come up with is nothing that hasn't been heard before from the older generation. It isn't an aspect that lingers for long, vanishing to make way for some of the laziest product placement ever committed to film. Whole segments are devoted to spending time within apps of YouTube, Instagram, JustDance and Spotify, to name a few. The majority of them feel like unnecessary additions, as the plot accommodates them just to push the brand names. The end result feels like an extended money grab, achieving as much as a Sony executive shouting app names into your eardrums for 86 minutes. It's said that, given an infinite amount of time, a monkey hitting random keys on a typewriter can type out the works of Shakespeare. 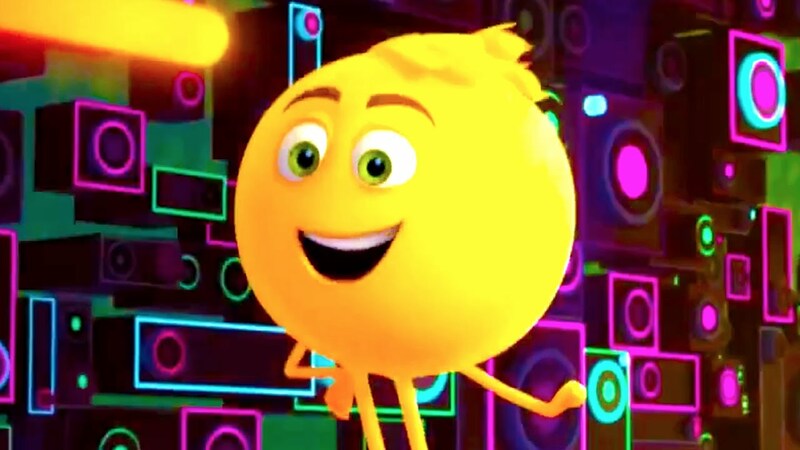 When three screenwriters can produce a script which feels so cynical, superficial and derivative as The Emoji Movie, such a theorem feels like closer to being a reality. A $50 million dollar advert seemingly containing not one iota of effort, this is lacklustre filmmaking.